We’re trying to be more healthy in the run up to our summer holiday. We’re not going to do very well at it this weekend due to garden fruit having to be made into pies, and Sourdough Surprises making us eat fried chicken and scones. So I’m going to do my best with dinner tonight and make a reasonably healthy fish and chips. 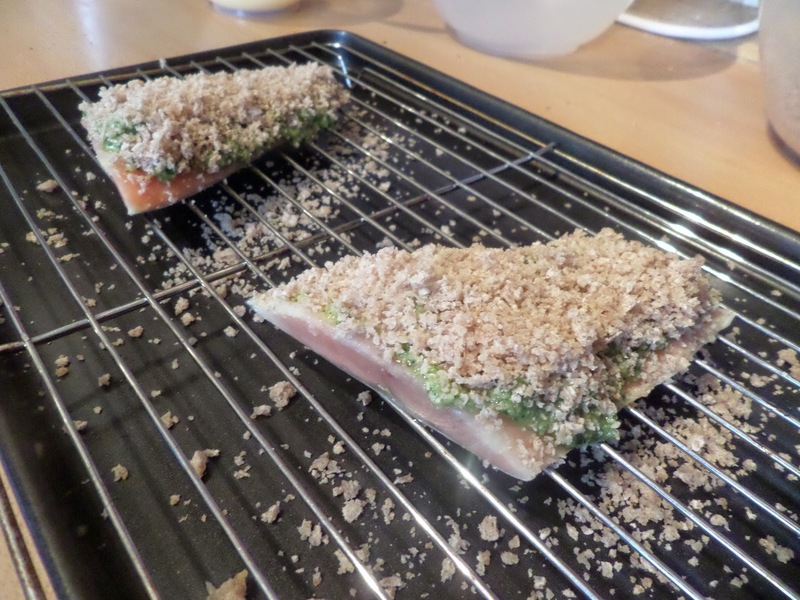 Fish is going to be salmon fillets from the freezer, topped with a mix of sourdough breadcrumbs and pesto that Soph made earlier in the week that’s in the fridge. These will be baked rather than fried. 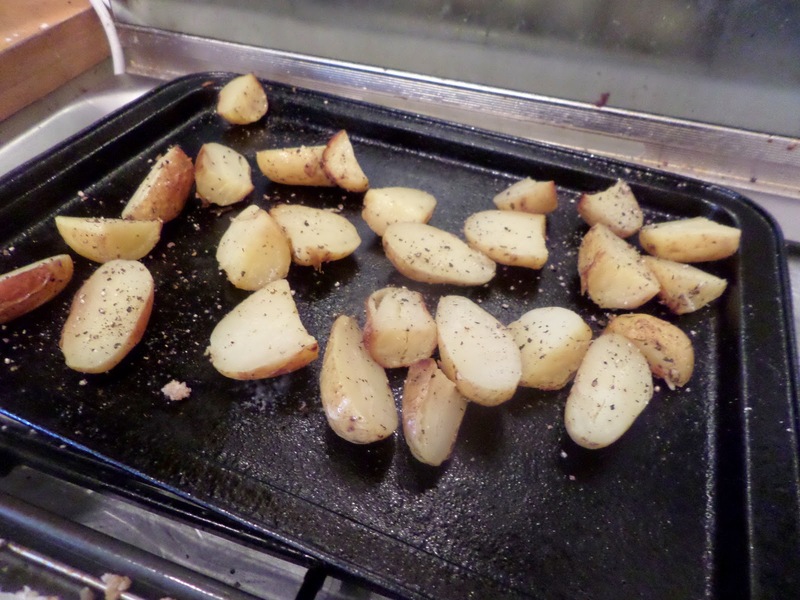 Chips will be potato wedges, with the skin on, baked not fried reheated roast potatoes from the fridge. 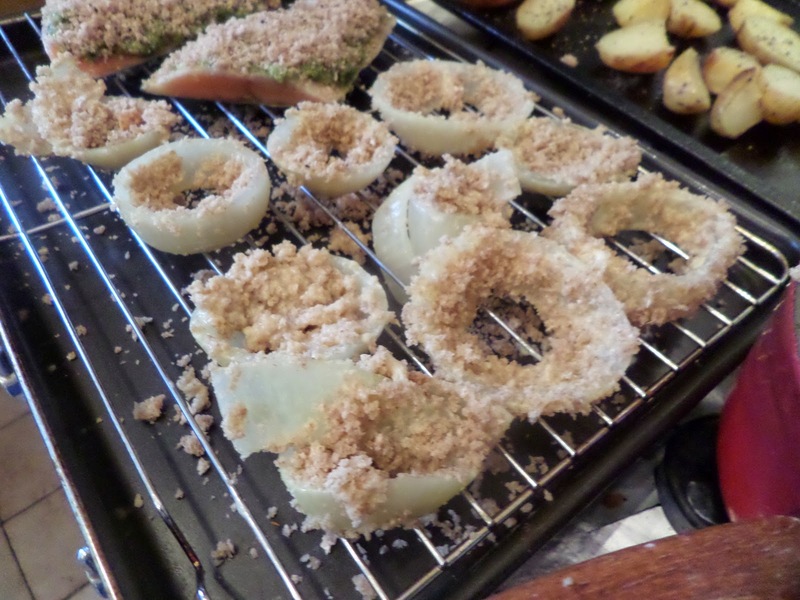 Onions rings… aren’t normally part of fish & chips, but while we were working out this morning we watched an episode of Cook’s Country where they did onion rings, so I can’t resist adding them to the menu. Unlike the ones one the show which were deep fried in batter, ours will be breadcrumbed and oven baked. Yeah… not doing that again! Breadcrumbs don’t stick to onions. Deep fry or GTFO. 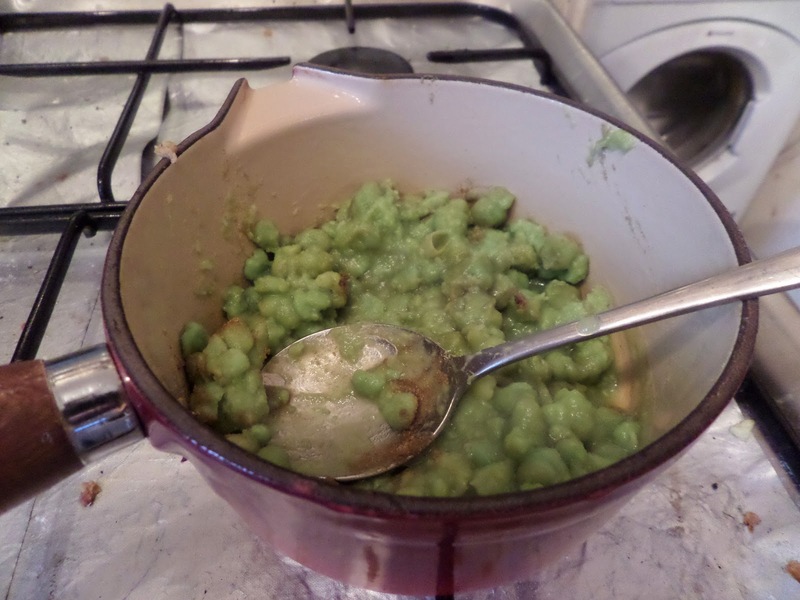 Mushy peas… come from a tin, but have some ground coriander added for our personal taste. 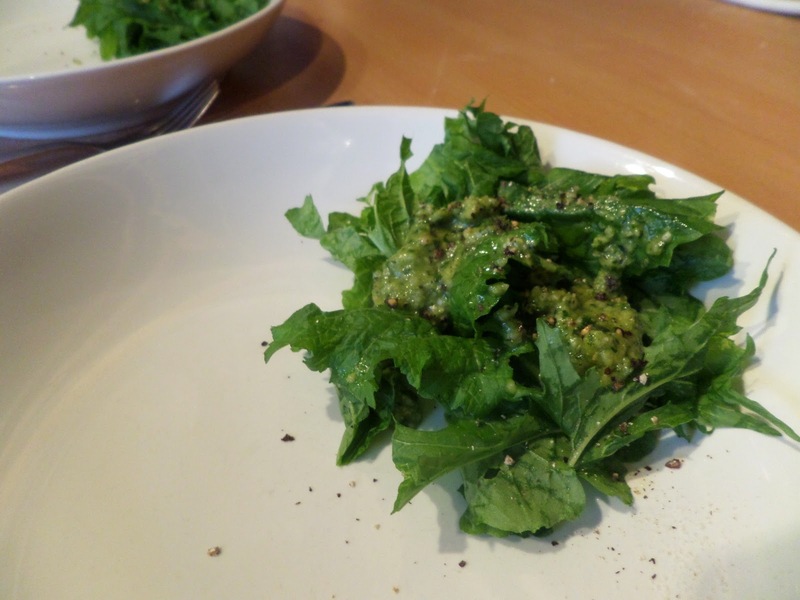 Finally the first harvest of salad leaves from the garden to top it off, with extra pesto. 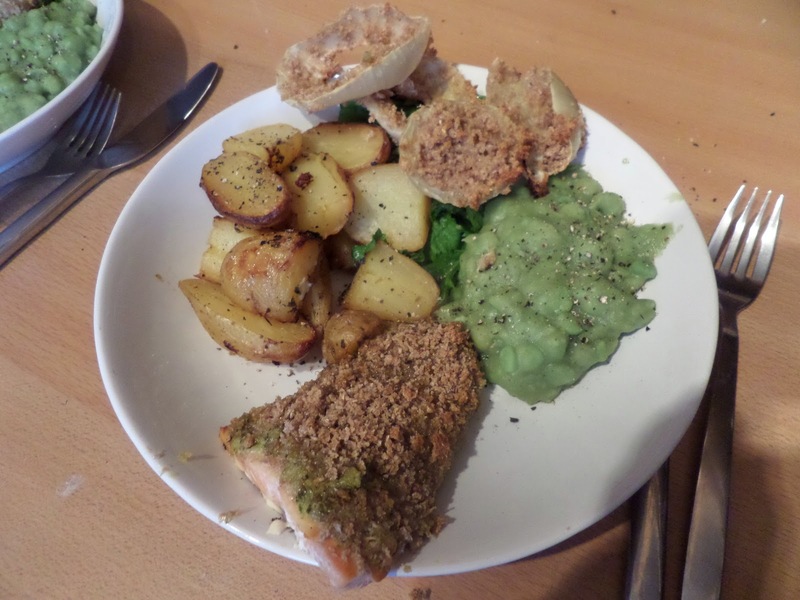 OK so it’s not proper fish and chips… but damn if it’s not a tasty dinner!